I'm oddly lazy in the morning when it comes to cooking. I mean like...I'm pretty good to go by 9. But since I wake up at 7, usually, that means me making a like...actual breakfast, doesn't happen often. I go to sleep the night before with great intentions to make something. Then I wake up and it's just like "Ughhh I don't wannaaaa." So, I was pretty proud of myself a few weeks ago when, one Sunday morning, I told Michael "I'm making a big breakfast! Waffles and eggs and bacon!" And do you know how he responded? He snorted. "That's funny that you think that's a big breakfast. When my mom would say she was making a big breakfast she made hash browns, an egg casserole, mini muffins, pancakes, sausage, bacon, the holy grail..."
But anyway, I digress. We're here to talk waffles. 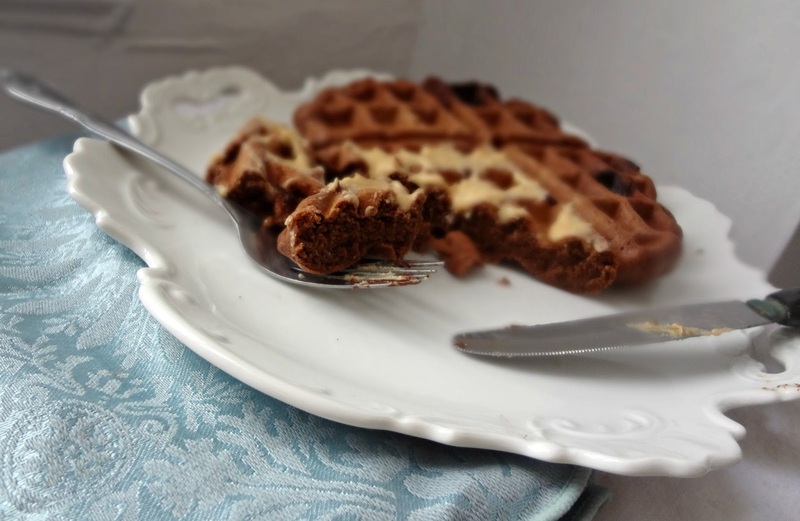 Chocolate waffles. Double chocolate waffles. 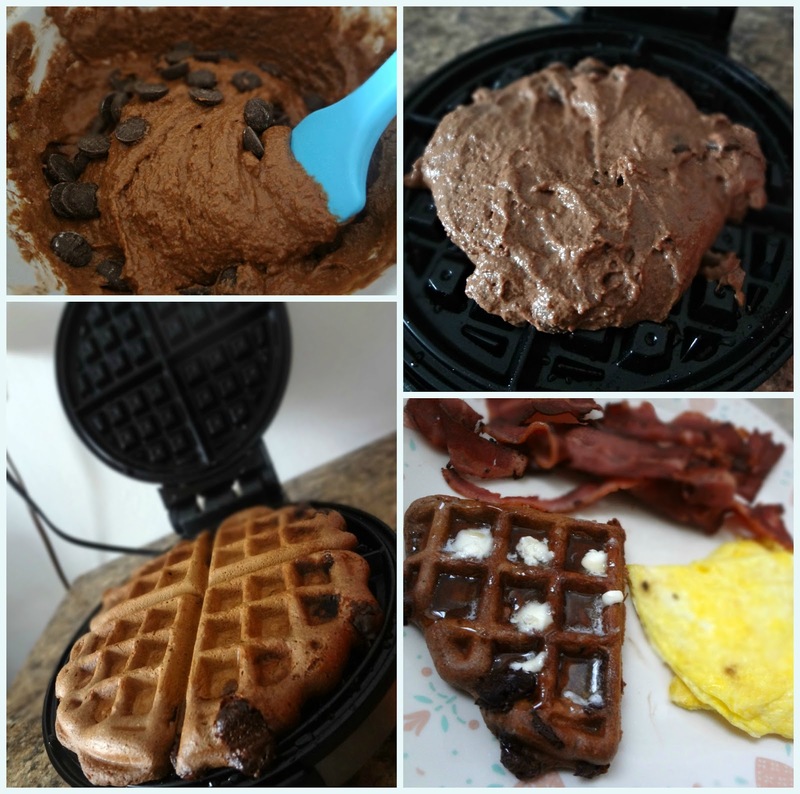 Cocoa powder + chocolate chips. Yes. Oh and they're like...fairly good-ish for you. We've got whole wheat flour goin' and the darkness of the chocolates makes em like healthy n such and just a lil bit of heart healthy oils as fat. 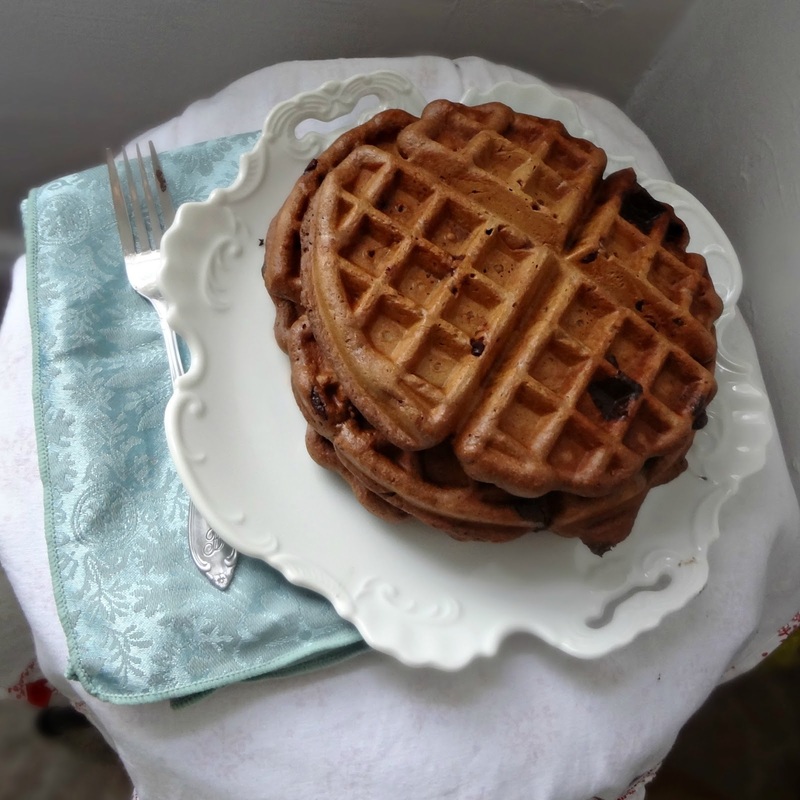 Now...if you decide to top these waffles with ice cream and hot fudge...that's up to you. You could also put fruit on top. 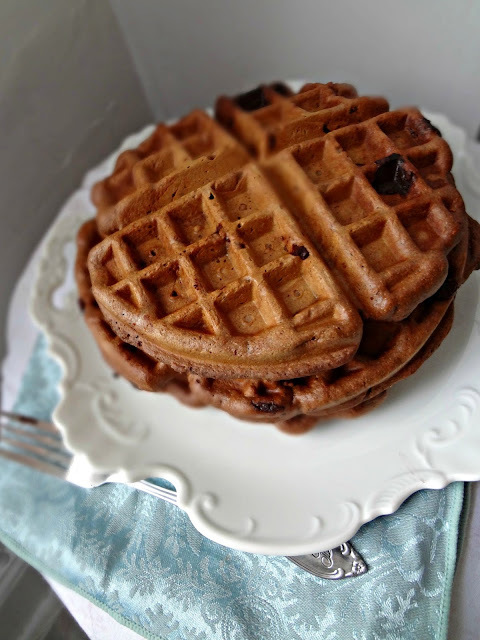 These waffles are just cool like that. 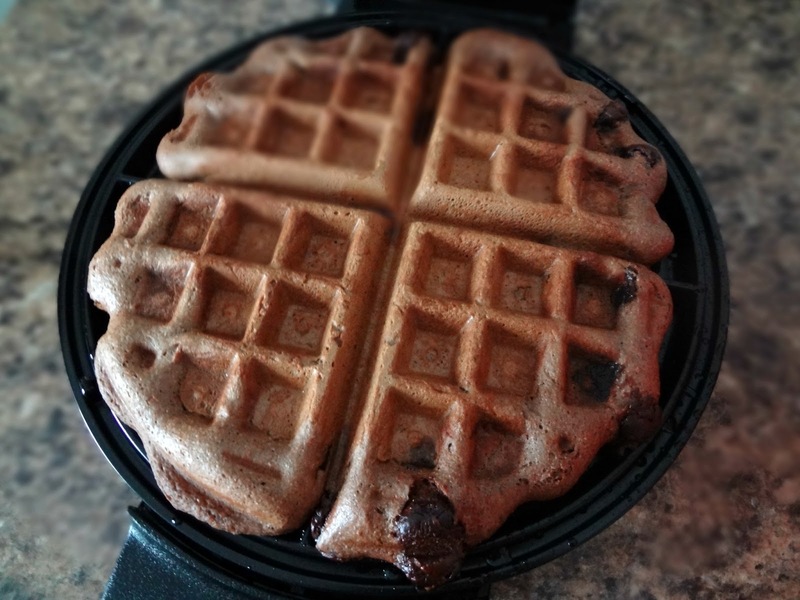 Pretty quick to whip up (you don't even need to whip egg whites like you do for my other waffle recipes), I was able to actually deliver on making these waffles that Sunday morning. I'm confident all you other busy (or lazy) peeps can do it too. 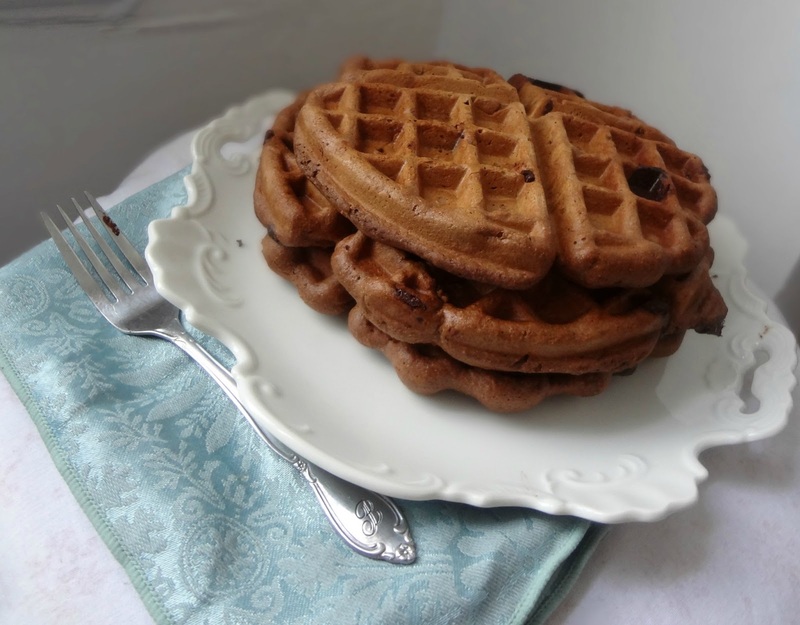 They're thick and chewy, but crisp on the outside, and they really just taste...well..like chocolate waffles. So yeah. Nothing not to like about that. Whisk together the dry ingredients. Then, whisk in the milk, egg, and oil. You'll want a wet, but thick, batter. If it's too dry add in more milk, 1 tbsp. at a time. Spoon 1/3 cup batter in the center of the waffle iron. Cook according to maker directions. Eat em with fruit, whipped cream, butter & syrup or...like me. Peanut butter. Oh yeah.